One third of electricity in Montenegro is generated by the sole operating thermo power plant in the country, while hydropower plants generate approximately the remaining two thirds. Electricity losses in transmission grid for 2016 are at 4%. Electricity losses in the distribution for 2016 grid are at 15.6% or 540.7 GWh. Oil products constitute 41.29% of the total primary energy supply in the country. Source: Electro Energy Balance 2016 for Montenegro, Estimated realization for 2015. Mandatory target for RES by 2020: This target is participation with 33% of energy from RES in the final gross consumption of energy. Source: IRENA, Cost-Competitive Renewable Power Generation: Potential across South East Europe; RES Legal, Legal sources on renewable energy, Montenegro Feed-in tariff. As a signatory of the Energy Community Treaty, Montenegro is committed to meet the savings target of 9% or 58.9 ktoe by 2018. Source: National Renewable Energy Action Plan of Montenegro to 2020. 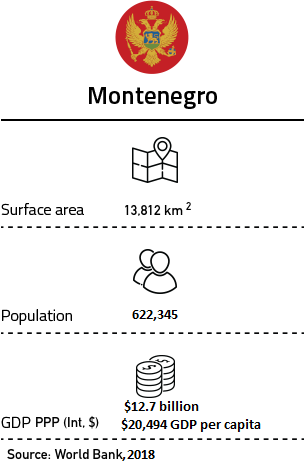 Greenhouse gas emissions in Montenegro are around 3.45 of MtCO2. Montenegro has calculated a potential emission reduction of 9% in 2018. Source: CIAT Climate Data Explorer, Montenegro.